Our Rain Barrel is different by design. 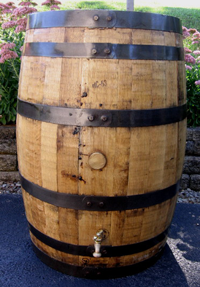 This rain barrel is made from an authentic used whiskey barrel and stores about 50 gallons of rainwater. 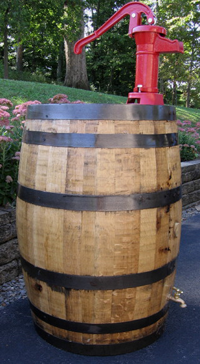 The barrels are 36” tall and have a 24” diameter. The original Rain Barrel comes with an easy to install downspout diverter, a pvc connection for the diverter on the back side of the barrel and an all brass spigot on the front. Our used rain barrels come from your favorite distilleries in Kentucky and Tennessee. They have been used to make whiskey and bourbon for many years. Although some of our whiskey barrels may have slight imperfections in them, this in no way affects their ability to hold rainwater. Depending on the length of time it has been since the barrels were emptied at the distillery, they may leak somewhat when first filled, but it usually only takes a day or so for the staves to swell and re-seal themselves to liquid tight condition. Unlike most used rain barrels on the market today, the spigot on our Rain Barrel is installed at a height of approximately ten inches, eliminating the need to place the barrel on a raised platform. We only use standard garden hose size all brass spigots. This allows you to attach your hose to water your plants by hand, or even a soaker hose that you can leave out for drip irrigation. 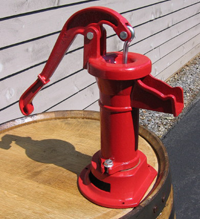 Although the barrel does not need to be elevated for the spigot to work, we do recommend that you place the barrel on some type of pad to keep it from being in direct contact with the ground. Also, you want to keep in mind that your full rain barrel can weigh as much as 500 pounds. When designing our Rain Barrel, we wanted to provide our customers with a complete rainwater harvesting system. We knew that because of the weight of a water saturated barrel, it would not be practical for most people to move their barrel in order to clean it out if needed. That’s why we chose to use a rainwater diverter that is simple to install and easy to maintain. The diverter we supply is installed at the same height as the barrel and can be used with both 2”x3” and 3”x4” standard size downspouts. This rainwater diverter channels water from the downspout to the rain barrel while separating any leaves or large debris. When the barrel is full, the diverter will automatically channel the rainwater back through your downspout where it will then drain away from your home’s foundation. This diverter system does not have to be installed higher than the inlet of the barrel, making it much easier to complete the installation and to allow access for the occasional cleaning of the trap that will need to be done. In addition, the diverter we supply can support two rain barrels simultaneously giving you the opportunity for maximum rainwater collection. Each diverter comes with easy to follow instructions and we are always available to help if you have any questions when completing your installation. Your new Rain Barrel will weather over time. To slow this process, we finish each barrel with a double coat of marine grade spar varnish. You can keep your barrel looking new longer by making sure it is drained in the winter where there is a possibility of freezing and by cleaning the barrel and recoating it with marine grade spar varnish annually. However, a weathered barrel is a beautiful barrel. Please remember that the water collected in these rain barrels is not for drinking or cooking purposes. To make your Rain Barrel even more useful and unique, you can order it with an old world style pitcher pump! This top of the line pitcher pump is made of rugged cast iron and comes with leather cup and valve parts. We have found that leather is much preferred to rubber due to its increased durability and resistance to cracking and dry rot. The height of the pump is 17½”. If you love your pump so much that you use it all the time and end up needing some repairs, spare parts are available from the pump manufacturer. When you order a Pitcher Pump Rain Barrel, we install the pump for you so there is no additional installation required for this barrel than with our standard Rain Barrel. Adding a pitcher pump to your rain barrel enhances the charm and character that automatically exists in an authentic used whiskey barrel. We realize that as hard as we try to think of all scenarios when developing a product, each customer can have special needs. Please keep in mind that we are always available to customize your Rain Barrel. Need the inlet in a different location? Need an additional spigot or connector? Whatever your situation, please feel free to contact us with your request and we will do whatever possible to ensure that you, the customer, is satisfied. If you’re not happy, we’re not finished! After all, we want you to enjoy your Rain Barrel for years and generations to come.